Ian Rankin (also writing as Jack Harvey) is a Scottish mystery author best known for his Inspector Rebus series which currently includes 21 novels and several short stories (the latest novel was published in 2016 with the title Rather Be The Devil). Here are the Ian Rankin books in order for his Inspector Rebus series, as well as his other published books. The series is listed in order of publication and chronological order in brackets. Malcolm Fox is a newer series by Ian Rankin (currently including unique 2 books, with two others also part of the Inspector Rebus series). The books are set in Scottland, and Malcolm Fox is working at the police – Complaints division (Internal Affairs) in Edinburgh. Here are the books in order. Born in 1960 in Cardenden, Fife in Scottland, Ian Rankin went to school at Beath High School, Cowdenbeath, after which he decided to study literature at the University of Edinburgh, from where he graduated in 1982. He was always a writer. At the very young age of 9-10, he was writing short stories, booklets, and comic book stories. Before he dedicated his life to writing, the author had a few interesting odd jobs, including being a grape picker, swineherd, taxman, hi-fi journalist, alcohol researcher, college secretary, as well as a punk musician. He also taught at the university. When he started to write novels, he didn’t intend them to be crime mystery books, considering his first two books Knots & Crosses and Hide And Seek (now part of the Inspector Rebus mystery series) mainstream fiction books. 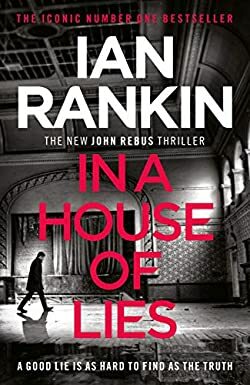 However his destiny was to write crime fiction, so Ian Rankin followed his calling and continued writing the wonderful Inspector Rebus series, which is a major contribution to the Scottish Tartan Noir genre (a sub-genre of the noir crime). After starting the Rebus series, he also began to write books in the new Malcolm Fox series, which has the main character intersect with Inspector Rebus. The first book, published in 2009 is called The Complaints. Except for the novella Death Is Not The End, every book in the Inspector Rebus series is available for the Kindle on Amazon – at least at the time of writing this page (I checked every single one of them). The author has written several short stories evolving around Inspector Rebus. The latest collection of short stories was published in 2014 as The Beat Goes On. The Inspector Rebus books have been so far translated into over 20 languages and they have sold in numerous countries all over the world. It has also been adapted to the TV with a series titled Rebus, running between 2000-2007. The book Rather Be the Devil, Inspector Rebus #21 marks Ian Rankin’s 30 years aniversary of writing the Rebus series. The first novel, Knots & Crosses, was published in 1987. He initially considered his first novel a standalone, however, eventually he continued the series fleshing out Inspector Rebus to the fullest. The novels are set in Edinburgh with its criminal elements. Inspector Rebus is an old-fashioned guy, one who comes from a family of blue-collar workers. He left school at the age of 15 and once he got the opportunity, he joined the police. Many of his co-workers are younger, more educated people who went to and finished university, so often in the Rebus novels, you will find a ping-pong of new and old ideas in office conversations. While in 2017 there will be no more Rebus book, a new one is said to come out towards the end of 2018 with a title as of yet unknown. Inspector Rebus is around 70-years old, he is retired, and Ian Rankin said that with the next book, he is ready to kill off the inspector. He could either die by natural causes or through being killed by gangsters. When I start the next book even I don’t know if he is going to be alive or dead at the end of it. There’s the potential for him to die at some point in the process. There is also additional news about a new TV crew who is interested in putting Inspector Rebus in front of the screen as well. After the previous TV show ended, Ian Rankin took back the rights to his books because he was not happy about the inspector being only one hour on the screen. Now, however, it seems that a new TV show will be in the works, to be aired either next year or the year after. Ian Rankin has also written additional novels apart from his two popular series. His very first book written and published is called The Flood has already the touches of his quality writing, and while it never reached the success of his series, it is both an interesting coming of age and a dark mystery novel in one. Ian Rankin has received several awards over the years for his Inspector Rebus series, including four Crime Writers’ Association Dagger Awards, which also includes the Diamond Dagger Award; then he won the Edgar Award, the Denmark’s Palle Rosenkrantz Prize, the French Grand Prix du Roman Noir, Germany’s Deutscher Krimipreis, and was shortlisted for the Edgar and Anthony Awards. He also received several honorary degrees from various universities, such as the Hull, Abertay, St Andrews, Edinburgh, and The Open University. Ian Rankin, while a successful novelist, has also had his own TV series in 2002 titles Ian Rankin’s Evil Thoughts, and in 2005 Rankin on the Staircase. Two years later, in 2007, he appeared in a few additional shows under his name, including Ian Rankin Investigates Dr Jekyll and Mr Hyde and Ian Rankin’s Hidden Edinburgh. He currently lives in Edinburgh with his wife and two sons, and working on his next novel.